Using a microscope is easy after a couple hours of practice, shooting photos or video through a microscope is hard, even after weeks of practice. Shooting regular video of regular sized objects I have to get the lighting, white balance, focus, exposure and framing all set, then I hit record and try to make what I want to happen, happen. Shooting microscopic video means I need to get all of the above done as well as everything required to use a microscope, find the creature I want to look at, set the magnification, set the iris on the light source and try not to bump the table or move my chair for fear of "Blair Witch" style footage. At first I tried shooting directly though the eyepiece but the results were ok at best, better if I used my cell phone instead of a dedicated camera. After a trip to the hardware store I rigged up an adapter that would allow me to put my camera's sensor in place of the eyepiece. This setup has two advantages, 100% of the light goes to the sensor, and it frees up both hands to adjust focus and translation of the slide. After a few weeks of this I decided that the yellow, incandescent, heater that was used to illuminate subjects was not up to par. The scope became warm to the touch after just a few minutes, it cooked my subjects and the dimmer made an annoying hum. A trip to the electronics supply gave me a relay, a USB battery charger, a transistor and a 2 watt LED flashlight. I used the transistor and a couple resistors to make a 2 watt LED dimmer, and using the relay to switch between external 5v power and the, now internal, USB battery, I now had a portable microscope that could be used, untethered, for up to 20min! The LED dimmer is designed to work from 5v (available from USB ports everywhere). 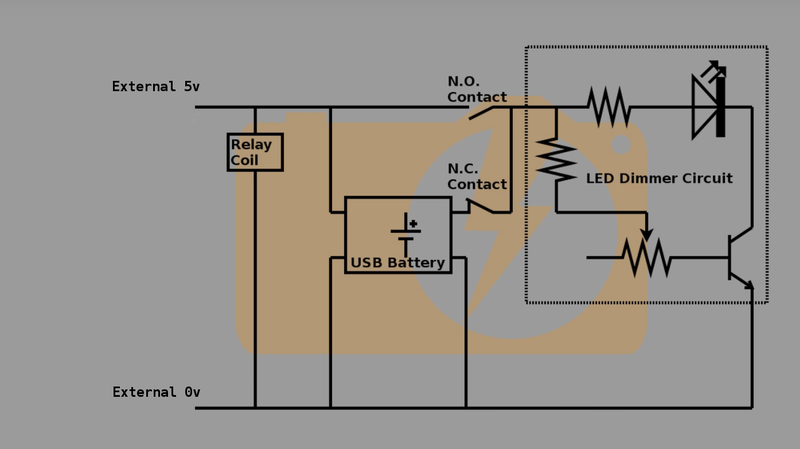 The USB battery is wired to the LED circuit through the normally closed contact of a relay. 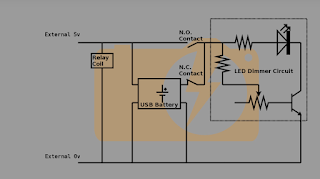 When external 5v power is applied to the relay coil the battery output is disconnected from the LED and the 5v external power is applied through the normally open contact. At the same time the USB battery is charged by the external 5v power so it can be used later.